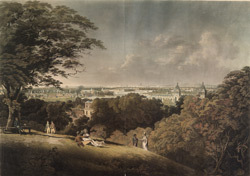 The summit of Flambard's Hill, (where the Royal Observatory stands) was a popular spot for topographical artists because of its excellent view of the River Thames and the City of London. Just below the hill, one corner of the classical Queens House can be seen. On the right hand side of the picture are the cupola roofed twin towers of the Royal Naval Hospital for disabled seamen. In the background, there are rows of sailing ships moored on the opposite side of the river. Also visible is the cityscape of London with many church spires and the great dome of St Paul's Cathedral.